Repsol Chain Lube is of the “waxy” type, a thick liquid that turns into a sort of wax or hard grease after it dries. The tiny 99 gram (3.49 oz.) 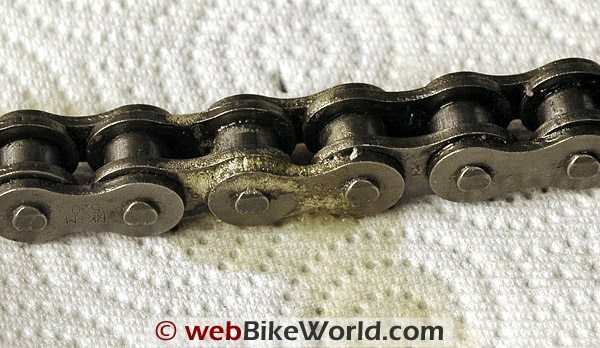 can has a sprayer with a built-in nozzle, but the nozzle is very short at exactly 10 mm, and this, more than anything, prevents this chain lube from becoming a favorite in the “waxy” class. The problem with the short tube is that it’s hard to direct the spray on to the chain because it can be difficult to hold the can close enough to the chain on some (most) bikes. But if you can orient the nozzle correctly, Repsol Moto Chain Lube works rather well — the product can be directed on to the chain with a minimum amount of overspray for this type of lube, and it seems to quickly cover the chain and after it dries, the chain has a nice coating of…something that we assume does the job! 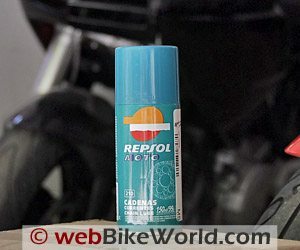 As with most of the “waxy” types of chain lubes, it’s probably better to apply the Repsol product when the chain is warm so the lube can hopefully work its way down into the chain and between the side plates. 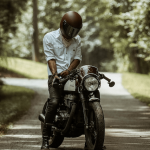 Repsol Chain Lube is relatively expensive at $0.35 per gram, and the tiny can means that the contents disappear quickly, so better buy two. More comments also on our 2008 Chain Lube Comparison home page.